4-5 volunteers are needed for an event hosted by Lackey Clinic. The purpose of the event is to engage potentially new donors in the community and share how Lackey Clinic is caring for the medically uninsured. Volunteers will welcome our guests, pass hors d'oevures, and hand out the donation packets. Every day, seven people die in home fires, most in homes that lack working smoke alarms. Sadly, children and the elderly disproportionately lose their lives. Working to reduce death and injury from home fires, the American Red Cross launched a home fire safety and smoke alarm installation campaign called Sound the Alarm. This Spring, Red Cross volunteers and partners are installing 100,000 free smoke alarms in more than 100 communities across the U.S., Puerto Rico and the U.S. Virginia Islands. The Coastal Virginia Chapter of the American Red Cross has partnered with the Newport News Fire Department and is looking for volunteers to Sound the Alarm by installing free smoke alarms in Newport News on Saturday, April 27 from 9 a.m. to 4 p.m. Provide fire prevention and safety education. To date, the Home Fire Prevention Campaign has been integral in saving over 500 lives, nation-wide! Lunch, drinks, snacks, & t-shirts will be provided! The Coastal Virginia Chapter also needs volunteers for Sound the Alarm events in Norfolk, Portsmouth, and Virginia Beach on May 4. One day of your life can change someone else's forever. Watch the Sound the Alarm PSAand visit www.soundthealarm.org to learn more and to register. No training or experience required! Online training information will be provided after signing up. Contact Debbie Sutton at Debra.Sutton@redcross.org or call 757-838-7320 to sign up. Volunteers are needed to support an alarm install event with the Newport News, VA Beach, Norfolk & Portsmouth Fire Department. 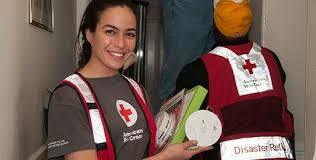 Volunteers will work in a supportive capacity, assisting with alarm installs & distributing fire safety information! This is a fantastic opportunity to get to know members of these wonderful fire departments, fellow Red Cross volunteers & to help install life-saving smoke alarms. To date, the Home Fire Prevention Campaign has been integral in saving over 500 lives, nation-wide! Lunch, drinks, snacks, & t-shirts will be provided! Additional information below. No training or experience required! Online training information will be provided after signing up. Contact Debbie Sutton at Debra.Sutton@redcross.org or call 757-838-7320 to sign up. Volunteers are needed for all positions at the Annual Riverside 5K By The Bay on May 4th. The race starts at the Riverside Rehabilitation Institute along Chesapeake Avenue in Newport News, and runs through the surrounding areas. This is one of our biggest fund raising events for the whole year. We do not need volunteers for the actual event, but in the weeks preceding the event, we have groups come and help volunteer on property to get ready for the event. They do things like wash fences, clean the barn, cut grass, weed, mulch. This is a labor intensive event as we turn the indoor arena into a sit down catered event so there are plenty of things to do. We have often had CNU students that come out as a group to volunteer for a day or half day. Visit https://dreamcatchers.org/bridles-boots for more information! Join our crazy cows and volunteer for the 2019 Chick-fil-A 10K/5K on May 25th! All volunteers at the race will receive a Chick-fil-A coupon and a race specific t-shirt! Riverside is dedicated to the education of our patients about their stay. These notebooks are given to every inpatient upon admission. Volunteers are needed for assembling the notebooks. The lead volunteer will meet the volunteers in the front lobby of the main building at 9:00 am. This event occurs monthly. Contact Carolyn Dough carolyn.dough@rivhs.com or call 757-594-2044 for more information or questions. There will be a Student Wellness Expo for students in K-12 and their families. The Girl Scouts will host a table for this event, and need volunteers to help out! If you are interested, please email Olivia Hooe at olivia.hooe.18@cnu.edu. Contact Carolyn Dough at carolyn.dough@rivhs.com or call 757-594-2044 for more information or questions. The Newport News Sustainability Division is in need of volunteers from March 1-3 for the One City Marathon! They specifically need volunteers on the 3rd from 8:00am-2:00pm for the Celebration's EcoStations at the Superblock after the race. Volunteers will receive a free t-shirt and service hours. Please contact the City's Sustainability Division at 757-269-2732 to sign up! This is part of the City of Newport News One City Marathon event. Students will be manning the Komen table, passing out giveaways, and signing up future volunteers. Email Tammie Mullins-Rice at volunteer@komentidewater.org or call 757-490-7794 ext 106 to sign up!